How can such a powerful healing plant put out such beautiful flowers? It never ceases to amaze me, just how spectacular God's creation is. 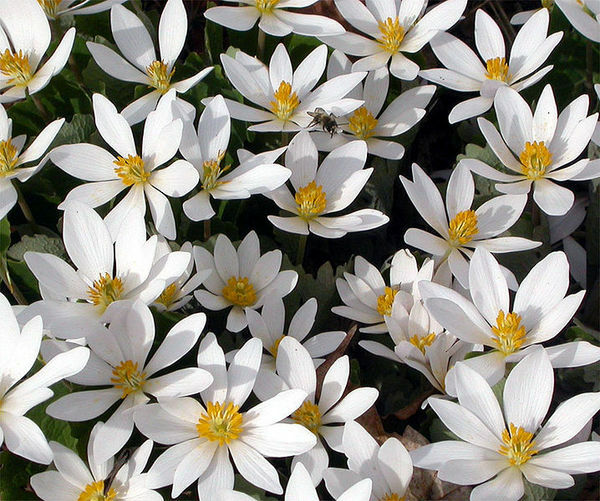 The same gorgeous flowers you see here come from the root that makes bloodroot salve, also used in what it known as black salve. Just thought I would share a little beauty in the visual sense, before I posted the latest black salve bloodroot salve reviews. I've been to the dermatologist many times to freeze or cut out some skin cancer. I was fed up with the cost and questionable treatment. I decided to use the Black Salve with DMSO and it did exactly what it is designed to do, it only reacted to bad cells, killed them and then healed wonderfully. It's not for the faint of heart, but if you decided to use it you must see it through to completion. The most painful area I used the salve was on a dime sized soft lump on my head just above my ear. It exposed bad cell there and also all behind and on my ear. I also found two hard lumps on the side of my neck the size of the good and plenty candy. Yikes, I know if a cancer doctor had of treated me they would have removed my ear and also removed good tissue and missed bad cells because they cannot differentiate bad cells from the good cells. This salve only reacts to bad cells. I did go to a ear nose and throat doctor who offered no tests or treatment just prescribed antibiotics (which I didn't pickup)and told me to go to my primary doctor. I wish I could get back that waste of money. My wife has been using black salve for a number of years now and has cured lot of skin cancers. Recently i found a small itchy spot on my left upper arm which would never heal so i put a small dob of the (good stuff)black salve on it.It turned into a black scab about the size of 5c piece in about 2 weeks the scab came out and the hole is now healing up beautifully , (and no more itch). I purchased the black salve for skin tags. I had a skin tag that seemed to be something more but was shocked when an eschar developed! I have a second "skin tag" to deal with after this one. I'm so glad I got the black salve. It has likely saved me much trouble down the road! I have the Body Wash now to check out my whole body for possible other cancers. Due to our naivety and our fair skin, both of us have suffered with skin damage in varying degrees over many years. We are now in our 70's very active and still runners in half marathons and 10k runs, and although over the years we have been to skin specialists and dermatologists the burnt off skin damage has returned and it was all a viscous cycle. We then heard of black salve and I could not wait to try it. We have had amazing success everytime, it is so easy to use and so effective, I have withdrawal symptoms every time the jar is becoming near to empty and I have to buy some more. The after care cream is one of the best I have used. After treating with black salve the after care cream helps it to heal quickly. We cannot speak too highly about these two products. Until next time, keep sharing the truth about health!